The British Business Bank is getting an extra £250m from the government to lend to small businesses, on top of the £1bn allocated to it last year. The bank, which is still in the process of being set-up following last year’s Autumn Statement, says it helped 8,000 small businesses in the first half of this year. It expects to generate £500m per year in new loans and investment. As the bank is based in Sheffield, Deputy Prime Minister Nick Clegg, an MP for the city, got to announce the new funding today, presumably pleased to do something that isn’t looking like David Cameron’s tetchy young sibling. 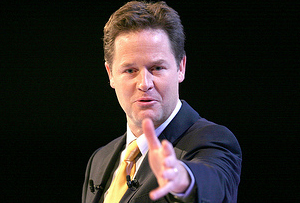 ‘I am determined that we do all we can to help companies that have struggled to get the investment they need,’ Clegg said. However, Labour’s shadow business secretary Chuka Umunna was, unsurprisingly, on hand to dismiss the government’s efforts. ‘Scheme after scheme trumpeted by Ministers has failed to significantly improve access to finance for our wealth creators,’ he said, according to the BBC. Umunna may have a point. Data from the Bank of England today showed that net Funding for Lending Scheme (FLS) loans were £5.8bn in the 3rd quarter of this year, three times the lending in the previous three months. Good news you might have thought, but the CBI isn’t so sure. ‘Despite overall FLS lending substantially increasing, Bank of England data shows that net lending to SMEs continues to fall so the recent move recalibrating the scheme towards business lending is welcome,’ Matthew Fell, CBI director for competitive markets, said, referring to Mark Carney’s recent announcement that the FLS would be refocusing on businesses and away from the bubbly housing market. So, while the extra funding is probably welcome, small businesses aren’t getting out the party poppers just yet. If George Osborne caves to business lobbying and announces a rates cut in Thursday’s Autumn Statement, then we might see some champagne flowing.